Choosing the right commercial door can be a daunting task. You want the right look, the right material, and the right level of protection for your store, warehouse, or factory. What’s more, you know you can’t open the business until the right doors are in place, both from an aesthetics standpoint and a security standpoint. So if you are in the process of try to figure out what kind of commercial doors are right for your establishment, you’re in the right place. In this post, we go over the essentials that you need to keep in mind when picking out the right commercial doors for you. So you can make an informed decision, get doors installed, and get the business up and running for opening (or reopening) day. Here’s a fun fact: In 2016 alone, the United States had nearly $75 billion worth of commercial buildings constructed. And that number has been steadily rising since 2010, with expectations of rising higher yet. Commercial construction, and then the process of renting out to businesses, is seen as a highly profitable endeavor for investors. And with that investment comes a commitment to making sure commercial structures are fitted with high quality, safe and effective commercial doors. This helps ensure that businesses want to rent out space! And if your business is one of the estimated 600,000 new ones to open each year, you know the importance of making sure you have the right doors. You might be thinking that a door is a door and that there aren’t reasons to pay close attention to the style you choose. But the reality is that commercial doors take on more responsibility in a business setting that residential ones do. And there are basic differences as well. The most obvious one is size. Generally, commercial doors are larger than residential doors. But beyond size, commercial door usage can also be drastically different. A clear example is a door at a loading dock. The sheer amount of times a loading door dock gets opened and closed is usually much more than a residential door. So you’d need to make sure to pick doors that can withstand constant use, as well as the occasional accidental running into by a forklift or other vehicle or machine. Dent resistance comes into play with commercial doors much more! These doors are also generally thicker and need to have insulation if the building they are attached to is temperature controlled. For durability matched with cost-effectiveness, aluminum is a great way to go. For starters, aluminum is easily painted over. So you don’t have to worry about your doors being an eyesore or not matching the aesthetic of your building. 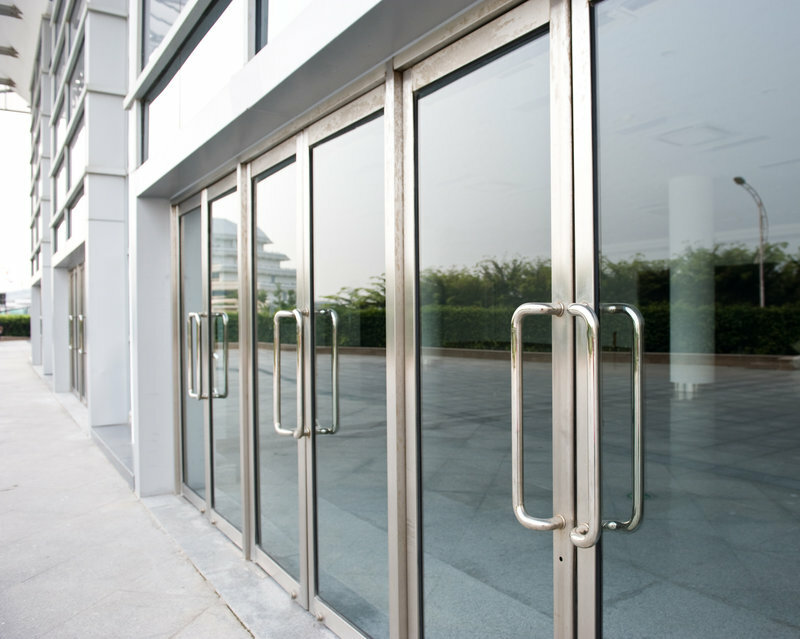 Aluminum commercial doors are tough and secure, making them very difficult to break into. That’s a big plus for storefronts. They not only give the appearance of being hard to penetrate, but they actually are! As such, aluminum tends to be the most common choice for these types of doors. The glass look is gaining in popularity. If you’ve ever shopped in an Apple store, for example, you know how great a glass door look can be. It gives your space a modern look that attracts customers simply by the fact that they can easily see into your establishment. It also allows for lots of light into the space, which is appealing. Plus it tends to make your space look bigger than it is. People often choose steel for areas of the commercial space that are less in view. For example, steel is a popular choice for back entrances. Steel is strong, sturdy and durable. It’ll last for years without you having to think about it. You aren’t going to have as much success trying to make steel look like a different material, in terms of matching aesthetics. But steel’s strength means it won’t need repair for years. And with the industrial look becoming more and more popular in the workplace, you might end up finding your steel doors match the aesthetic of the commercial space quite nicely! For commercial spaces with a lot of traffic through the doors, installing a high-speed option is often the way to go. They are especially effective in maintaining the temperature inside the building because they aren’t open for long enough for too much air to flow in or out of the building. For that same reason, they are effective at keeping dirt from blowing in from outside. If your business has a warehouse or loading dock, you’ll want to install overhead garage doors. They are the most effective doors for larger open spaces. You also have style and material options with garage doors, namely a roll-up or a sectional door. And they are often customizable in size to accommodate your specific workplace. These are the go-to doors for retail spaces. Since they represent the aesthetic of your business and are a big part of the impression potential customers get, they need to be appealing to look at. Fortunately, storefront doors are often the most customizable. They’ll also need to be durable. You’ll (hopefully!) have lots of traffic coming in and out of them during business hours. So you can have doors that aren’t reliable. But the reality is that over time, even nice doors can suffer from the wear and tear of running a business. So your storefront doors need to be easy to repair and replace when the need arises. Hopefully, this post gave you a good sense of all the options for commercial doors that are out there. The best first steps are to identify your needs, and then work backward from there to figure out which types of doors you want, and which materials would work best for you. If you have questions or would like to know more, contact us today.